Co-op Month 2017: Co-ops Commit! 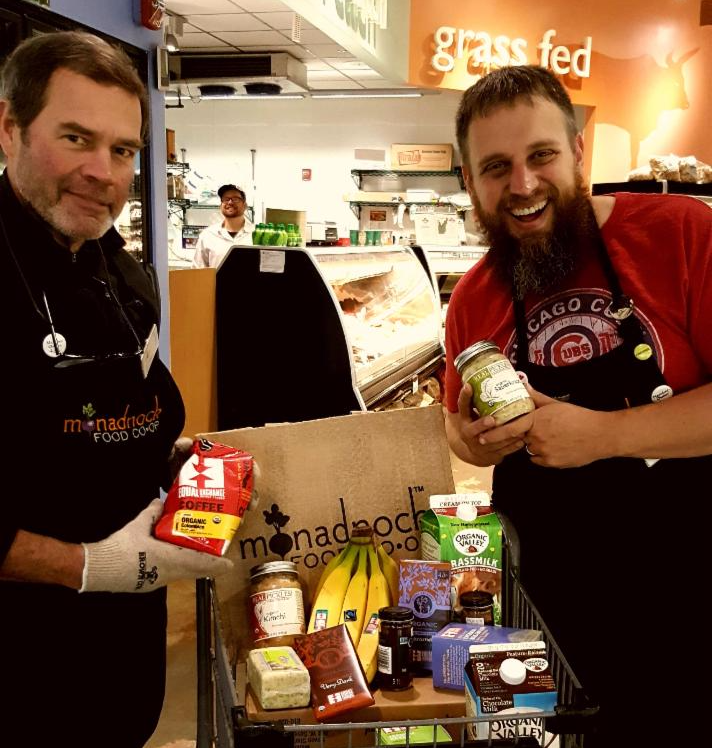 This October, Neighboring Food Co-ops across the Northeast have been joining over 30,000 co-ops and credit unions across the United States in celebrating Co-op Month. This year, the National Cooperative Business Association CLUSA International encouraged co-ops to use the theme “Co-operatives Commit” as a way to highlight the many ways that co-ops are committed to their communities. As a federation of over 35 food co-ops and start-ups across the Northeast, the Neighboring Food Co-op Association (NFCA) communicate our shred commitment to our communities and our impact on the food systems and economy of our region. For example, our member co-ops provide good jobs for over 2,000 people, generate revenues of more than $315 million, and purchase more than $60 million from local producers each year. City Market/Onion River Co-op in Burlington, VT, celebrated member ownership and participation, with over 500 member-owners attending their Annual Member Meeting in October and a Member Loan Campaign supporting their second location in the South End! Greenstar Co-op Markets in Ithaca, NY, shared their commitment to sustainability, including eco-conscious products and a solar farm, as well as a healthy food access program that enables more people in the community to become member-owners, participating in and benefiting from the co-op. Hunger Mountain Co-op in Montpelier, VT, celebrated their commitment to growing the Co-operative Economy, noting that they sold $1.2 million in products from other co-ops last year, totaling 4.9% of Hunger Mountain Co-op’s annual sales. A special web page also highlights the co-operative businesses that consumers can find on their shelves. Monadnock Food Co-op in Keene, NH, also encouraged shoppers to look for the NFCA’s “Go Co-op!” signs on store shelves to find products made by other co-ops including dairy products from Cabot Creamery Co-operative and Organic Valley, fairly traded coffee, tea, and chocolate from Equal Exchange, and naturally fermented vegetables from Real Pickles. 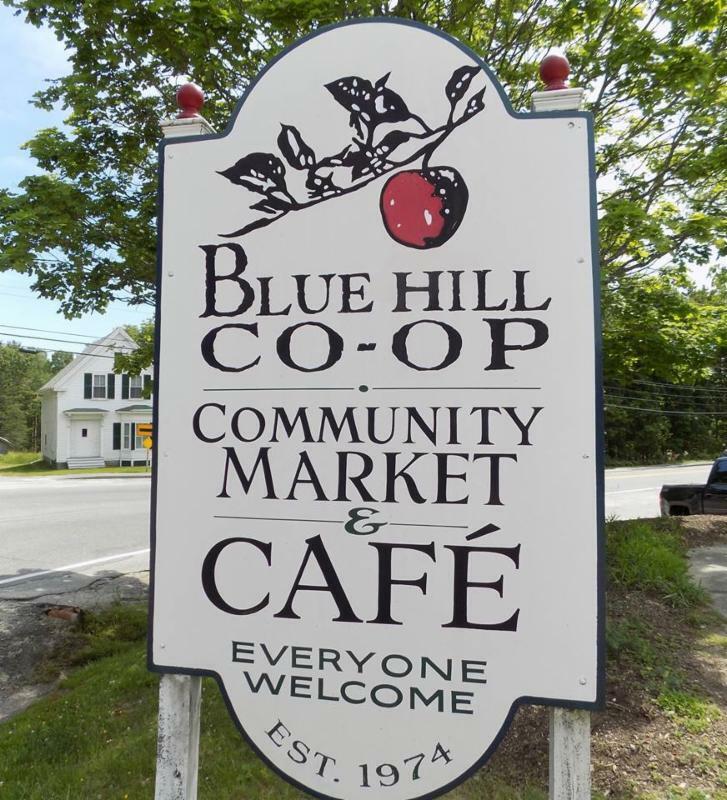 The Neighboring Food Co-op Association (NFCA) is proud to welcome Blue Hill Co-op in Blue Hill, ME, as its newest member! The Co-op began as a buying club in 1974 out of the desire of a handful of people to bring more fresh produce, cheeses and whole foods to the Blue Hill Peninsula of Maine. The buying club expanded their offerings to include bulk grains and, within the first year, membership reached 100. In 1979, the Blue Hill Co-op was incorporated and, after many iterations, moved in 1993 to its current location in downtown Blue Hill. In an effort to foster the growth of a vibrant local economy, promote healthy eating choices, and continue our efforts toward a more sustainable food system, the new Co-op building promises ample space for customers to comfortably shop among an expanded selection of local and organic products. Blue Hill Co-op now employs 30 full & part-time staff members, many of whom have been with the Co-op over 10 years. The Blue Hill Co-op prides itself in supporting local & organic food systems, purchasing over $766,000 from Maine producers in 2016. “At a time when community ownership over food sources is more important than ever, it seems only natural that we would work with NFCA and co-ops across the Northeast to strengthen the awareness of the positive impacts our food co-ops bring to the communities we serve,” said Kevin Gadsby, General Manager of Blue Hill Co-op. The NFCA is a federation of over 35 food co-ops and start-ups across New England and New York that are working together toward a vision a thriving co-operative economy, rooted in a healthy, just and sustainable food system and a vibrant community of co-operative enterprise. For a map of your Neighboring Food Co-ops, please visit http://nfca.coop/members. Have you noticed the “Cave to Co-op” signs in the cheese section of your local food co-op? 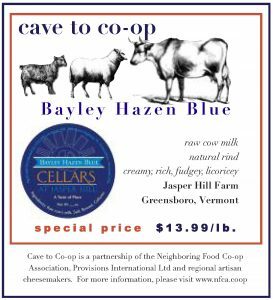 October’s special cheese is “Bayley Hazen Blue” from Jasper Hill Farm in Greensboro, VT. Bayley has developed a loyal following because of its fudge-like texture, toasted-nut sweetness, and anise spice character. Try pairing with a fruity red dessert wine, toasty Imperial Stout, or a hunk of dark chocolate. Bayley is also ideal for crumbling over a juicy burger or adding to a salad with spinach, walnuts, and dried tart cherries. Thanks to Dorsey & Whitney LLP for their support of our Neighboring Food Co-ops. On October 4th, a broad-based coalition of 210 farm, rural, worker and consumer advocacy organizations released principles for a fairer Farm Bill that would address the lack of competition in every link in the food chain. Included among the signers was The Neighboring Food Co-op Association (NFCA), and member food co-ops Buffalo Mountain Food Co-op (VT), Hunger Mountain Co-op (VT), Littleton Food Co-op (NH), Monadnock Food Co-op (NH), and Upper Valley Food Co-op (VT). “As we near negotiations on the 2018 Farm Bill, it is more important than ever that New England’s family farmers and consumers be at the table,” said Erbin Crowell, Executive Director of the NFCA. “And we encourage people to join or renew their membership in the New England Farmers Union to strengthen our shared voice in DC”. The groups point out that growing consolidation in the agribusiness, food processing and supermarket industries lowers prices for farmers and wages for farmworkers and other food chain workers, erodes rural economies, and raises prices while limiting choices for consumers. The letter calls on Congress to address the ongoing consolidation of these industries with policies that address unfair contracts for farmers, increase market transparency, reform USDA guaranteed loans and guarantee worker rights. For more information on our New England chapter of the National Farmers Union, visit: www.newenglandfarmersunion.org. The Neighboring Food Co-op Association (NFCA) is an affiliate member of the New England Farmers Union (NEFU), representing our commitment to collaboration among consumers and our region’s family farmers and fishermen to influence food system policy and build a more vibrant, resilient and co-operative food system in New England. For more information on our partnership & how you can become a member, visit: www.newenglandfarmersunion.org/co-operation.